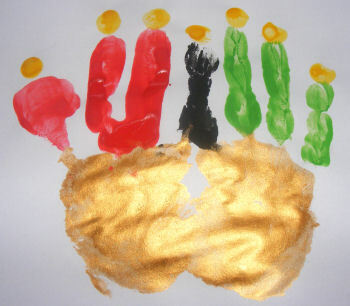 Here is a festive Kwanzaa craft perfect to help teach your children about Kwanzaa. 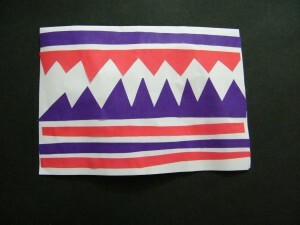 Here Kaboose shows you how to make this Kwanzaa Flag Garland in great detail. 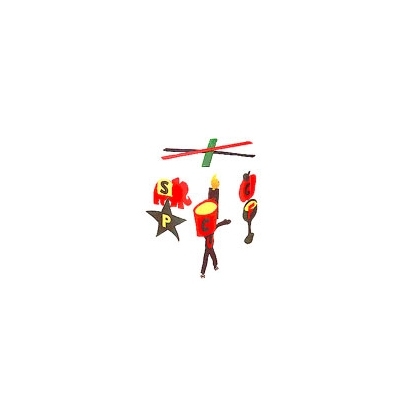 It uses the symbolic colors of the holiday… red, green and black. Here is one of our very own Kwanzaa crafts. In this Kwanzaa Greeting Card craft we will show you how to make a greeting card for the Holiday Kwanzaa. 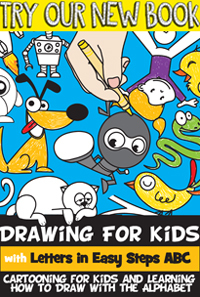 It is a very easy craft, so even young children will enjoy this craft. You simply need some paper , scissors and glue. 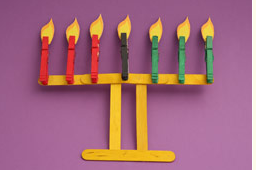 I found this Kwanzaa craft over at Spoonful. Here they use the 3 colors of Kwanzaa as well as the 7 principles of Kwanzaa to make this adorable mobile. This will make an awesome Kwanzaa decoration as well as teach your children about Kwanzaa. Here is a fun craft that children of all ages will love to make. Activity Village shows us how to take your handprint and make it into a very cute Kinara. It’s a quick, fun and messy Kwanzaa craft for kids! They will love it. I have another fun Kinara craft for you. This one came from Kaboose and it promises to be tons of fun. Here they use doll pins, spools, paint and some other materials to make this festive Kinara. Kaboose even has tons of information to teach you more about the Holiday of Kwanzaa. 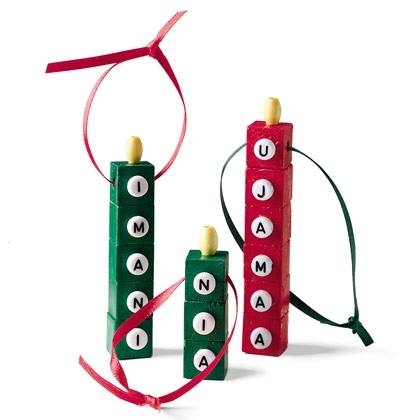 Here is another entertaining Kwanzaa craft. In this craft Making Friends shows you how to incorporate the 3 colors of Kwanzaa into this colorful placemat. 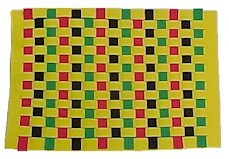 Your kids will have fun weaving strips of red, green and black craft foam into this festive Kwanzaa placemat. 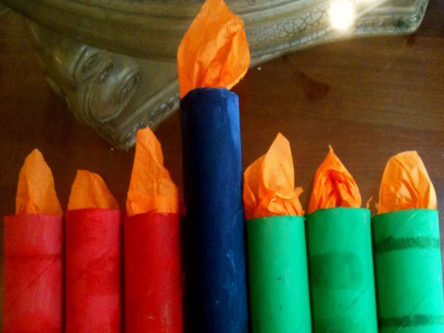 Here is a great Kwanzaa craft that both boys and girls will love making. I found this craft at Yahoo! Voices and it’s a good one. 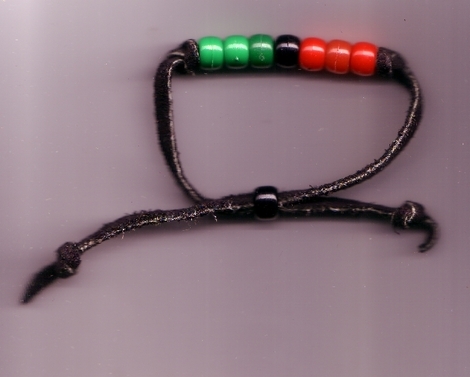 Make these Kwanzaa bracelets with the colors of Kwanzaa and give them to your family and friends as gifts. They will love it. Kwanzaa is about the festival of the first harvest of the crops. So, this Bubble Wrap Corn just makes sense as a craft for Kwanzaa. Give your child all the details about Kwanzaa as you make this fun bubble wrap craft with them. Check out No Time for Flashcards for all the details. 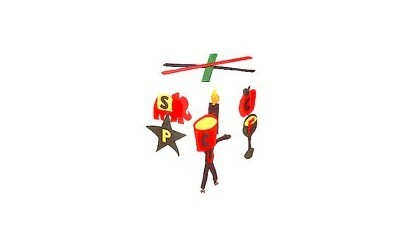 Here Spoonful shows us another wonderful Kwanzaa craft. This time they make these cute Kwanzaa bead candles. Here they use craft cubes, oval beads as well as other materials to make these festive candles. This is a great way to introduce the seven principles of Kwanzaa. Family Education shows us a great way to teach your children a little bit about Kwanzaa and the African culture. 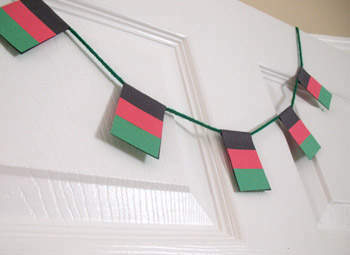 Here they use different flags of Africa to make a great decoration for Kwanzaa. As you are making these flags of Africa with your children it is a great time to teach them about Kwanzaa. Remember Kwanzaa is the festival of the first harvest of the crops. Corn was a very important crop. 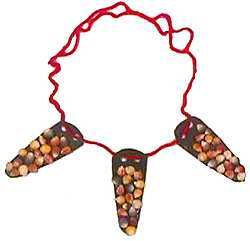 So, this Corn Necklace craft is perfect for Kwanzaa. Here Better Homes & Gardens explains how each ear of corn represents a child in the family. Check out the craft for all the details. 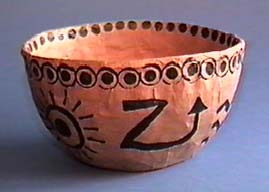 Check out this gorgeous and super festive Papier Mache Bowl perfect for Kwanzaa. I found this at Crafts Holidays site and thought it was beautiful. 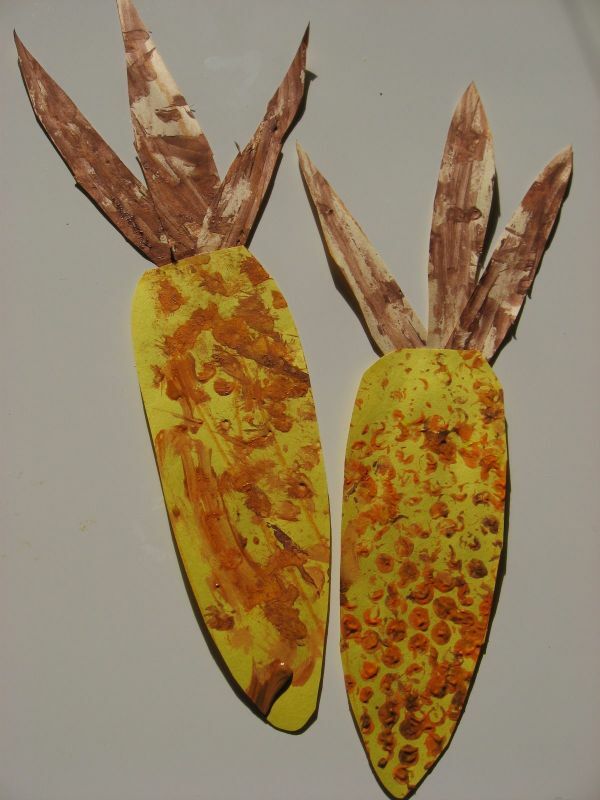 Here they use Papier Mache to make this bowl…. so it is sure to be a lot of fun for the kids. Use this bowl to hold the Mazao (or fresh fruits and vegetables) at your Kwanzaa table. Nick Jr. has the right idea with this Kinara Kwanzaa craft. It is just adorable and the children will love making it. Here they use craft sticks as well as clothespins to put this Kinara together. 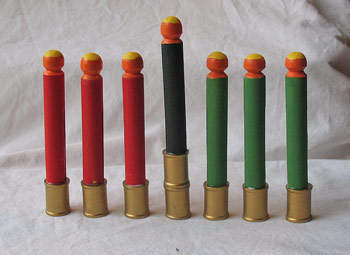 They also don’t forget the colors of Kwanzaa with this Kinara. Kids love to do crafts with tissue paper and cardboard rolls. And, this Kwanzaa craft will be no exception. I found this craft over at PBS and thought it was a great one to include. Make sure to check this Kinara craft out. 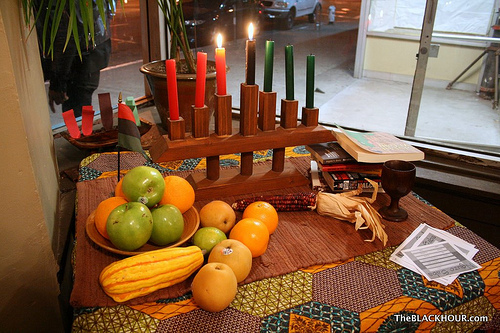 Plus, they also go into great detail of the 7 Principles of Kwanzaa…. great to teach your children.